Can Atilla is a Turkish composer and musician. He is a big name in his home country. For instance, he composed the anthem "Dirilis" (“Resurrection”) the official music for the 90th anniversary of the Turkish parliament in 2010. It was by performed by the Presidential Symphony Orchestra (CSO). Next to these special achievements, he is also a respected electronic musician and has -amongst others- recorded five albums for Groove Unlimited. “Hi-Story” is his new cd on the label since 2005. How many electronic musicians are there from Turkey? So Can is somebody we must cherish. For one on his earlier albums in a review was written: “TD or not TD: that's the question! More TD than TD themselves". Atilla is a great fan of Tangerine Dream and that can be heard very well in his albums. But where a lot of musicians take the mid-seventies or early eighties period of that legendary band as a source of inspiration, Can concentrates more on TD from the late eighties and the nineties. Just take a piece like “The Kings And The Beggars (Part One)” and let yourself be carried away to the rhythms, the patchy solosounds and the guitars of TD-albums like, to name a few, “220 Volt Live” and “Turn Of The Tides”. The sequences are well crafted and the melodies quite symphonic and memorable. The titletrack is e great example of this. A nice piano is used in “The Flashbacks”. On several occasions, Can uses Turkish instruments (or samples) in the compositions, like in “Sultan’s Sequencer”, a well-found title, and in “Thieves Of Bagdad”. And, if that is not enough: between all these impressive electronic pieces is a really outstanding progressive rocktrack, called “The Kings And The Beggars (Part Two)”. It is a stunning beautiful and romantic piece with piano, Hammondorgan, Mellotronstrings- and choir as well as drums. Focus: eat your heart out! Hopefully, Can will record more of these numbers in the future. And, if that is not enough, “Solar – Is ……” is a wonderful film-like piece. Again, a Turkish atmosphere closes the album in “Nights Of The Rain Prayers” but together with sequences this makes a very special effect. 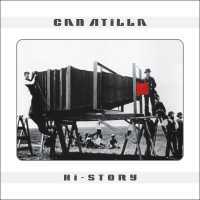 With “Hi-Story”, Can has delivered an album with many faces. An album that easily draws it’s inspiration from European classical music, to Turkish music and Tangerine Dream. This is an unexpected and exiting mixture. 2011. Paul Rijkens You don’t know Can Atilla yet? So, here’s a good way of remedying it. A great superstar in his country, Can Atilla is a solid Turkish composer and musician who is much at ease in works with symphonic character as in more accessible and electronic works. Strongly influenced by Tangerine Dream, Jean Michel Jarre and Vangelis, Can Atilla built himself a legion of fans that impatiently wait for his electronic works on Groove. More than 6 years distance his last album appeared on Groove (Concorde) and Hi-Story, and Can Atilla didn't change at all. Hi-Story is a solid opus of an EM strongly inspired by the 90’s with rhythms and melodies weaved in the paths of albums such as Turns of the Tides, Tyranny of Beauty or still Revolutions and Chronology, but with a delicious tribal mixture. Sequences which pound and skip in a nest of pulsations a bit resonant, "The Kings and the Beggars (Part One)" sets the tone to this Can Atilla album with a title which seems to come straight from Turn of the Tides' sessions from the cult group of the Turkish musician. Nervous, the rhythm is covered by suave discreet choirs and keyboard riffs which succumb to a soft avalanche of percussions. "The Kings and the Beggars (Part One)" borrows then a more rock tangent with a nice mixture of sequences and percussions which bear riffs and guitar solos at once sober and incisive, overhanging a beautiful melodious approach sometimes dreamy sometimes rocky. "Hi-Story" continues this introspection of the musical universes of Tangerine Dream with a warm synth line which wraps a beautiful sequential movement skipping in a symmetric linear movement. Other sequences are grafted and shape a beautiful oscillating structure which undulates with grace under the spell of angelic choruses. Memories of Tangerine Dream poor in our ears with this title which seems to embrace periods so diverse as Falshpoint, Wavelenght, The Park or still Stratosfear 95 with a rhythmic approach which becomes more nervous. Some nice synth pads with sensual fluty tones wrap the hatched flow while "Hi-Story" hesitates between a honeyed and nervous approach to finally board a more complex one where rhythmic linking are as twisted as the enchanting melodies which surround them. It’s a very beautiful title, with good synth solos, which deserves the listening which it requires, as well as "When Kafka Drink Orange Juice" which hugs closely the same harmonious and rhythmic tangents. "The Flashbacks" is another highlight of Hi-Story which begins with a twinkling rivulet of synth pads to limpid and fluty tones. Notes of an austere piano fall. They awake sleepy choirs and a rhythm which fidgets under a very nice line of piano with a lot of wavy notes lines. A bass line spreads its notes which slightly skip, the piano becomes livelier and "The Flashbacks" imposes a rhythm as much heavy as slow, endowed with a beautiful furtive approach arched on a slow oscillatory movement. The beauty of this title is the subdivision of synth lines which throw good solos, clouds of mist as well as melodious lines with clear tones of Turkey which chords of a Turkish guitar coat with a beautiful tribal melody. This Turkish tribal approach goes on in "Sultan's Sequencer" whose curt and jerky rhythm is wrapped by a synth filled of clan and electronic lines and a beautiful romantic guitar. "Thives of Bagdad" also plunges us into the tribal atmospheres Turks with a great title among which rhythms and atmospheres tergiversate between a music a bit technoïd; with curt and slamming percussions à la Jarre, electronic; with wavy sequences and a fluty synth, and finally ethereal; with a smooth tribe approach. These genres become entangled in a hybrid structure where melody and anarchy merge in a delicious musical cocktail. Very good! Sequences wave in a frenzied ballet of crisscrossed keys and lay the stormy bases of "Shadow of the Knights". The percussions tumble down and push the rhythm towards a stronger approach where synth pads and riffs get harmonize with eerie choirs and sinuous solos, floating on a rhythmic structure became wilder. "The Kings and the Beggars (Part Two)" has nothing to do with the stamping rhythm of "Part One". On the contrary! It’s a smooth and sensual hymn to rights and a soft warning shot to inequity. It’s a wonderful slow dance which brings us back in this nostalgic era of the Saturday nights dances where Procol Harum organs dragged their languishing tones under heavy percussions and choirs of mist. WoW! It’s splendid and we won’t understand why it’s naming isn’t For the Love of...Simply delicious! With its dramatic keys which pussyfoot in nice cosmic mists and synth winds to tones of soft murmurs and flutes with bitter sighs as in Le Parc, "Solar - is …" is a smooth electronic melody which is slowly carried away on crisscrossed sequences flittering in a soft ethereal dream. It’s kind of nice and melodious while being very melancholic. Tribal breaths and a bow striking the strings of a Turkish violin open "Nights of the Rain Prayers". Quite moving with its heart-rending violin, the intro is hiding little by little in the shapes of a delicate me lody of which sequenced arpeggios alternate in fine wavy loops and skip towards pulsatory percussions. The tempo is outlined. Halfway between synth-pop and electronic music, it cavorts under strata of an imaginary violin, concluding Hi-Story by a melodious and symphonic approach which is the privilege of Can Atilla’s last opus. Once again Can Atilla goes out from nowhere to offer us a very good unexpected album. A melodious album where tribal, synth-pop and electronic rhythms are wrapped with this delicious quintessence that are the influences of Tangerine Dream and Jean Michel Jarre. There are great tracks laying on Hi-Story. Titles which are a bit out from the main axis of a more conventional EM but which preserve this unique cachet of the good and melodious approaches that the Dream and Jarre scattered in the 90’s on well structured rhythms and sequences and where synths distance themselves by structuring beautiful melodies rather than to concentrate on virulent solos. Hi-Story is in the continuity of Live and Ave, two opuses which established the credibility of Can Atilla in this wonderful universe of sounds and give rhythms which is EM.